President Donald Trump tweeted early on Friday that he was “looking forward” to the May jobs report, which he had access to the night before. This unusual move may have signalled to some traders that the report was good. 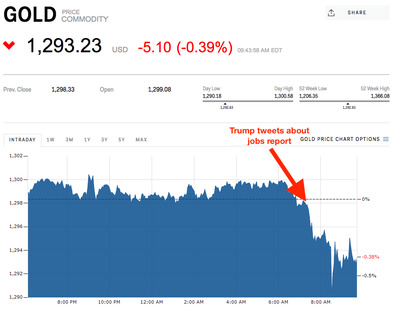 Gold extended its declines, while bond yields moved higher after Trump’s tweet. President Donald Trump may have given gold and interest-rate traders a clear heads-up on the solid May jobs report, judging from market moves after his early tweet. At 7:21 a.m. ET on Friday, Trump said he was “looking forward to seeing the employment numbers at 8:30 this morning.” The president and other senior members of his administration are privy to the numbers a day before their release, but a Bureau of Economic Analysis rule bars executive-branch employees from commenting until an hour after the numbers are officially made public. Apart from the government employees who work on the report, the other people with early access are a small group of reporters, locked up in a room without mobile phone or internet access until after 8:30 a.m.
That is because the jobs report is viewed as one of the most important indicators of the US economy and often moves markets. Trump’s tweet may have signalled to investors that the numbers were good, and they turned out to be: nonfarm payrolls increased by 223,000, more than economists expected, while the unemployment rate fell to an 18-year low of 3.8%. “We have rules in markets for a reason: so that we have a fair and level playing field,” Wright told Business Insider. Though Trump’s tweet suggested a strong jobs report, it may not have been the White House’s first time giving clues on the numbers.